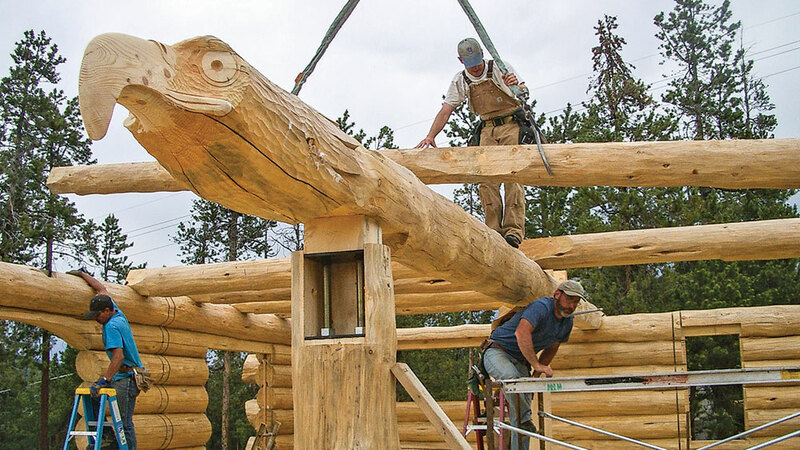 Log homes aren’t just distinctive by the way they look, they also stand out for how they’re built. In a conventional house, the weight is supported vertically, but a log home’s structural support comes horizontally, with the load of the house resting almost entirely on its perimeter log walls. It’s critical that they be built to precision. This is known as the joinery system. The load-bearing surfaces are known as the horizontal surfaces. These surfaces form the top and bottom of the log profile, or its shape as viewed from the end. The sides of logs are known as its visible surfaces and define the look of the logs when stacked. There are many different horizontal interface designs to account for the natural tendency of logs to shrink, swell and twist as they dry (for examples, turn to page 30). Wood species react differently during their seasoning process, so producers design a system that works best for them by taking into account the type of wood they’re using, its moisture content and the logs’ size and profile. One approach is not superior to another — much depends on your selections and personal preferences. Besides providing structural stability, the horizontal interface must allow for a weather-tight seal. Many manufacturers cut grooves and channels to accommodate sealing adhesives — usually foam or caulking — and create an impenetrable bond. Other refinements in the horizontal interfaces are checking and drying grooves and drip edges. Because upward-facing checks (wood fiber separation) can collect water, a checking-drying groove lets air reach the log’s inner core so it dries at the same rate as the log surface. But that’s just the beginning. Let’s review a few of the building basics that create a solid, well-built log home. Once the logs are stacked into walls, they need to be securely fastened to remain aligned while accommodating differential settlement — the tendency of logs in a wall to shrink at different times, rates and amounts. As part of their building systems, producers rely on a fastening schedule, which prescribes the location and frequency of each fastener. The grade of logs, species, moisture content and location of windows and doors all affect the type of fasteners used. Producers almost always include fasteners in their material packages. Your producer may offer more than one fastener option or specify using more than one type of fastener on the same wall. The types of fasteners commonly used in log walls include spikes, screws, drift pins and through-bolts. Spikes are basically huge nails. For most wood species, the builder must first drill a hole to accommodate the spikes, which are driven into the logs with a sledgehammer. Lag screws are pointed bolts available in different diameters up to a half-inch. Again, holes must be drilled in the log to accommodate the screws, which are tightened with an impact wrench. The screws are installed at staggered intervals so one is never on top of the other. Through-bolts are threaded rods that are installed in holes drilled vertically throughout the entire wall system. In some systems, through-bolts are combined with tension springs to aid in the home’s settling. Once the entire wall is assembled, the bolts are tightened at the foundation level. The bolts require re-tightening periodically as the home settles. This is something you, as the owner, can do. Drift pins are often required in areas with high seismic activity. These pins are typically galvanized pipe or rebar set vertically in the wall system in drilled holes. They’re typically placed 4 feet apart and at each side of window and door openings, although in earthquake-prone areas, they can be as close as 8 inches apart. Threaded log home screws offer the benefit of not requiring pre-drilling. The installer drills and countersinks the screws in one step. Although smaller in diameter than other fasteners, most threaded screws are heat-treated for equal or greater strength. Regardless of which fastener a producer uses, it will be calculated into the design and engineering of your home. Once erected and secured, a log home needs to be made weather-tight. That’s where sealants come in. Sealants protect your home against air and water infiltration. They are needed in log home construction because of the special nature of wood and what happens to it after it is harvested — namely the way it checks, twists and shrinks as it adjusts to its new situation as part of your log home. Commonly used sealants are caulking, chinking, adhesives, foam gaskets, expanding foams and splines. Depending on the wood’s moisture-content level, the greatest movement in your wall logs will occur during the first two to four years after construction. Any movement after that should be minimal. So, a successful sealant system should accommodate a considerable amount of movement in the first few years, as well as the less drastic changes than occur over the life of your home.